When we think of fast food, we often think about the typical burger meal or pizza, but more of us indulge in snacks and crisps than we probably do takeaways. You can’t walk into any supermarket, garage or corner shop without being tempted by a vast array of packets of crisps and savoury snacks, and it’s not easy to keep up with the healthy eating plans when you’re hungry and surrounded by treats. Can Crisps Be Part Of A Healthy Eating Menu? Crisps have an image of being fat laden and having no part in any kind of healthy eating regime. If you make wise choices though, you can still enjoy your favourite snacks without doing too much damage to your waistline. Many savoury snacks are marketed at kids but in fact contain a lot of salt so should be limited. Always look on the back of the packet to see what the salt content is, some crisps and snacks are definitely worse than others. For fat content, look out for snacks that are baked rather than fried. Many fast food manufacturers are starting to realise that people don’t always want to fill themselves full with fatty fast food, but they do need something to fill the gap when they are out and about. 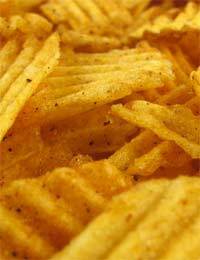 Baked crisps and snacks will always be healthier for you than fried, as these can be incredibly greasy. What Other Snack Options Are There? If you’re on the hunt for a savoury snack to fill the gap, you could do worse than substituting your daily bag of crisps with some nuts. If you can get some unsalted nuts, all the better but even salted ones will fit in better with a healthy eating plan than a bag of highly processed and often artificially flavoured crisps. Nuts do contain fat, but this is the good fat that many of us don’t tend to eat enough of. Just don’t overdo it! If you’re in a supermarket, pick up some mini cheeses if you like them, again they are high in fat but the portion size means that you can keep the calories down and enjoy a savoury nibble. Kids love to eat mini cheeses too, and they come in all sorts of varieties, including lower fat options if that’s something you’re worried about. You’ll get protein and calcium from this little snack treat. Popcorn is under rated – usually served up in cinemas sprinkled with copious amounts of sugar it can be high calorie. Try adding your own flavourings if you have time – cinnamon for a sweet flavour or herbs, chilli and spices for a savoury hit. Much lower in calories and fat, and the corn will give you an added fibre boost as well. If you haven’t got the time to make your own, you can buy readymade popcorn that’s lower in calories and comes in different sweet and savoury flavours. You just need to hunt for it in the supermarket aisles and go out ready prepared! Sometimes you just want to dip – and breadsticks and chopped vegetable are great with dips and hummus. You can eat them on their own too – although the celery, carrot and other vegetables needs preparation in advance, a few crunchy breadsticks can just be popped into a pocket or a kids lunchbox, and will do as a snack until something more substantial is on offer.